Weighing only 125 lbs and having a small shallow profile of merely 23”, the Alpha 18K can use a Ceramic glass lens or Standard 24” Fresnel to create the smallest, lightest and most versatile 18K ever designed. At the core of this innovation is a custom made reflector molded out of quartz composite material. This allows the lamp to be placed much closer to the reflector, therefore reducing the physical size of the Alpha 18K by a third compared traditional 18K's on the market. The light output from this new reflector increases output by nearly 15%, adding a softer and smoother lighting pattern compared to the oversized conventional aluminum reflector. 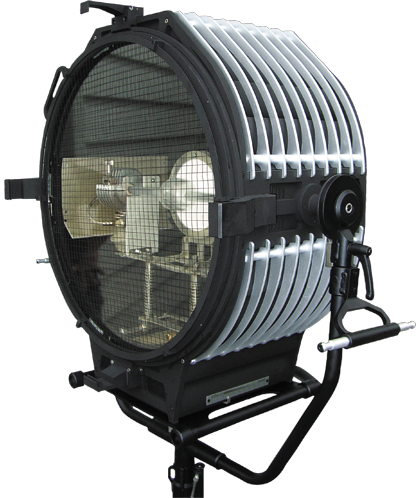 The extrusion/vent system is precisely angled to get maximum cooling efficiency , the small diameter reflector allows for better heat circulation, along with a new back bulkhead, which assures that the Alpha 18K operating temperatures remain within specifications in any critical position, including straight down. A double suspension system (one to the lamp heat sinks and one to the chassis support) makes the Alpha 18K lamp less fragile to rough handling, occurring during location transportation. Whether it’s creating a soft Fresnel look or a hard shadow using the open eye set-up, the Alpha 18K gives any cinematographer or lighting director the tool he needs to get the job done. Lens Change Quick Release Latch to Change Lenses Instantly. The Alpha 18K Offers Two Modes: Fresnel and Open Eye. Revolutionary Quartz Composite Reflector (8% Brighter Than Standard Aluminum Reflectors). Spring Loaded Suspension System To Absorb Vibration To The Lamp. Back Cover Specially Designed To Operate With The Light Pointing Straight Down. 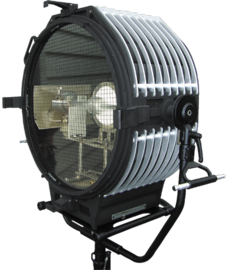 The Combination of A High-Efficiency-High-Temperature-Small-Reflector, Structural Air Vents And This Back Cover Provides Efficient Convection Cooling In Any Operating Position. Double Springs Cooler Suspension To Protect The Lamp During Rough Handling And Transport. Easy Front Access To Lamp Leads Terminal And Wing Nut. Fresnel Lens Add 24 lbs. Clear Ceramic Lens Add 14 lbs.